We can provide textbox watermark in windows application as its available in ASP.NET AJAX extender. Textbox watermark means a textbox a value we can set for some helper text if the value is not set. When a textbox is empty, it displays a message to the user. Once the user has typed some text into the textbox, the watermark appearance goes away. The typical purpose of a watermark is to provide more information to the user about the textbox itself without cluttering up the rest of the page. You may have seen hint textbox which Microsoft has used in Outlook or website. 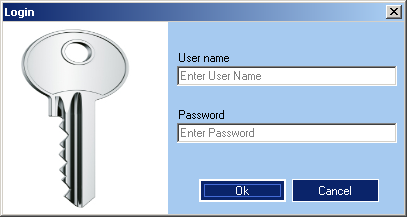 I have created a windows form which asks for user name and password from user (see the screenshot). I had to implement that functionality today and it is surprisingly easy to achieve. The standard winform textbox does not support this functionality natively, so this code will address that shortcoming by handling the display of the prompt text ourselves. This useful program has beautiful and easy to use interface. Feel free to provide your comments.